I made meatloaf for the kids. Green beans and kraft dinner on the side. Riv did the best job eating, followed by Em-bear. Maxy has gotten to be kind of a picky stinko lately, but even he ate most of what was on his plate. made the other swai fillet tonight. same recipe. was yummy. Mmm, chicken katsu. It's been too long since I've had that. IAN, next time you've got too much meat for your skillet try cooking in batches. Also, Target is particularly terrible about produce. Are there any supermarkets near you? Not buying produce and doing it all at once were both issues of time. I'd do it in batches and would've taken a second trip to the (very nearby) dedicated grocery store if I'd been cooking it earlier, but as it was I was focusing on being done before 9 PM. Currently have chicken and Brussels sprouts on the stove. They were frozen chicken and Brussels sprouts because I'm a cheap ****, but IT'S STILL COOKING BECAUSE I'M DOING MORE THAN MICROWAVING MARIE CALLENDER'S, DAMMIT. Since we're dropping the bar so low here I can finally post; I heated pastrami and sauerkraut in a pan for a sandwich. I even toasted the bread. oh mane. There's nothing like a good pastrami sandwich. Soooo mussels are selling at Wegmans for $7 for a 2-pound bag, so I'm making seafood pasta tonight. One of the store's recipes. Homemade bibimbap sounds heavenly. I might have to try that sometime this year, though I'll probably bungle it somehow. There is nothing to bungle. This is seriously one of the easiest dishes I cook. I use this recipe for inspiration https://www.budgetbytes.com/2017/01/bib ... bowl-meal/ (no kimchi in our house last night, I omit the sugar and forgot the cucumber, added roasted sweet potato bites and we ate baby spinach leaves raw instead of cooking them) and twas delicious!! Valigarmander wrote: Homemade bibimbap sounds heavenly. Panfan wrote: homemade bibimbap sounds heavenly. Panfan = Val = bibimbap spambots confirmed. The seafood pasta came together much more quickly than expected and was about as good as I expected...I got a store-made sauce back when I'd injured myself but if that hadn't happened and/or I'd had more time I would have made the sauce myself. Usually ends up better that way. 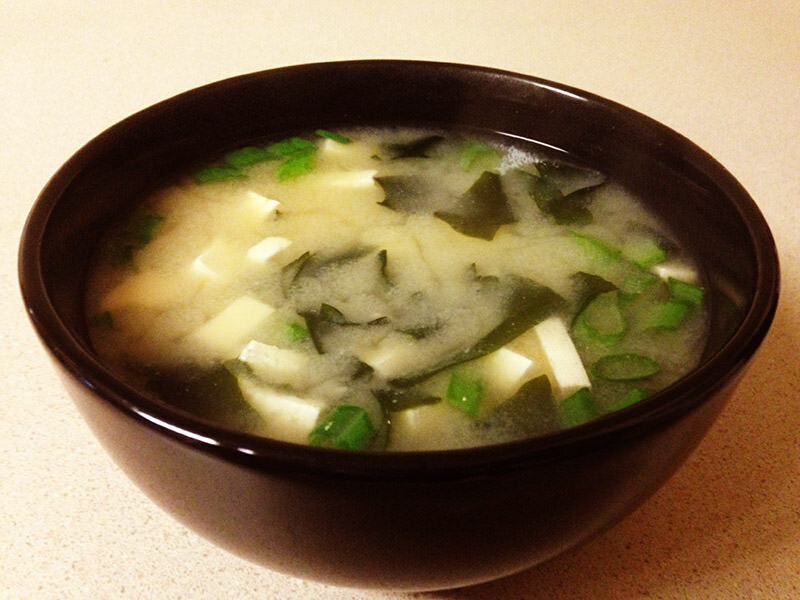 * Dashi is a fish stock that forms the base of miso soup. They come in different forms like powder, granules, or bags; just make sure you have the right amount for four cups of soup. ** Miso paste comes in different colors (white, yellow, brown, etc.). Generally the darker the color, the stronger the taste, so go with whatever works for you. I find yellow miso to be a good middle-of-the-road choice. In a medium saucepan, prepare the dashi base according to the instructions that come with your dashi of choice (typically you boil water and then mix in the appropriate amount of dashi). Reduce heat and whisk in the miso paste. Stir in the tofu, green onions and seaweed. Simmer for two to three minutes and serve. Now you can enjoy miso soup in the comfort of your home without having to trek out to a sushi restaurant. It's a great appetizer, or just something nice to eat on a cold day (such as today). If you use my recipe you may want to scale back on the tofu, onions and seaweed, depending on how chunky you like your soup. I made potato pancakes. From scratch. Didn't have any maple syrup, so I ate them with Herdez Guacamole Salsa. I hate guacamole, but Herdez Guacamole Salsa is rad. I didn't have time to get ingredients for a new recipe, but I did have pork, so I made tonkatsu. It's exactly like chicken katsu but with pork. Oh I definitely need to keep tabs on this thread. I've been gathering recipes to learn. I started learning how to cook on my own in college when I wanted to make my own pasteis de natas - and I did it. I went straight to **** dessert. I should try that again and post it here. made MY SIGNATURE DISH (tm) last night...bacon alfredo! Start your water and make the bacon at around the same time so that by the time it's finished and you've cut it into smaller pieces the water's boiling. That way you can have the pasta cooking while you make the sauce. To make the sauce, first add the bacon and some type of fat (just using the bacon fat is the easiest, but getting rid of the fat and using olive oil or unsalted butter works too) to a saucepan. You can also add herbs and spices at this point (I always use a little red pepper and whatever else I feel like...usually thyme since I have some growing rn), as well as optional frozen peas (trust me, it's yum). Once everything is reasonably incorporated (and if you're using peas, they've mostly thawed), add cream (I often sub half and half for heavy cream, but whole milk also works pretty well) and bring the sauce to a boil. Let it simmer for about 2 minutes then take the pan off the heat. By this point the pasta should be done and you can toss everything together and add copious amounts of cheese (pecorino or bust, my dudes).